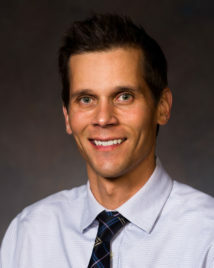 Tobin graduated from the University of Utah in May of 2009 with a Doctorate in Physical Therapy and joined Fit Stop Physical Therapy after graduation. Tobin believes in an active treatment plan for his patients. He takes a hands-on approach to physical therapy and enjoys helping others improve their quality of life. Tobin has extensive training in the treatment of spine-related pain. He developed “Spine Fit,” a customized five week program for low back pain consisting of a combination of the latest manual therapy and exercise techniques. It is based on the most recent evidence and is proven to get results. Tobin also has specialized training in geriatric/balance issues, and neurological populations with an emphasis in Parkinson’s disease. Tobin is certified in the LSVT BIG® exercise program for Parkinson’s disease. In his spare time, Tobin enjoys staying active with his wife and four children. Camping, hiking and biking are some family favorites. Tobin works at the Heber City Fit Stop location.